In 1985, Bellcore proposed the idea of an optical carrier-to-carrier interface that would allow the interconnection of different manufacturers’ optical equipment. This was based on a hierarchy of digital rates, all formed by the interleaving of a basic rate signal. The idea of a Synchronous Optical NETwork (SONET) attracted the interest of carriers. When fibre optical cables were initially deployed as a medium for high-speed digital transport, the lack of standards led to the widespread deployment of proprietary optical interfaces. This meant that fibre optic transmission equipment from one manufacturer could not interface with equipment from any of the other manufacturers. Service providers were required to select a single vendor for deployment throughout the network and they were locked into the network control and monitoring capabilities of that manufacturer. Although this technology satisfied the bandwidth needs of the network for several years, it was evident that this arrangement could not support the future needs of the industry because of the limited interconnection capabilities. As stated above in 1985, Bellcore proposed the idea of an optical carrier-to-carrier interface that would allow the interconnection of different manufacturers’ optical equipment. This was based on a hierarchy of digital rates, all formed by the interleaving of a basic rate signal. The idea of a Synchronous Optical NETwork (SONET) attracted the interest of carriers, Regional Bell Operating Companies (RBOCs), and manufacturers alike and quickly gained momentum. 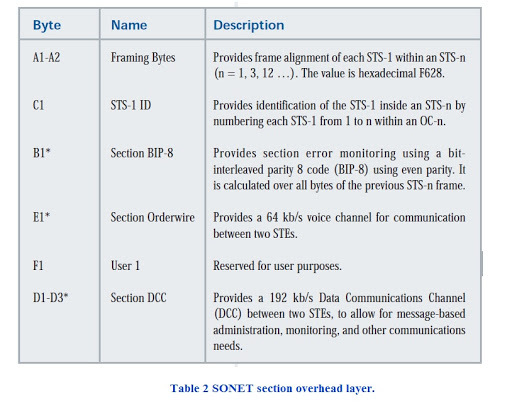 Interest in SONET by CCITT (now International Telecommunication Union – ITU-T) expanded its scope from a domestic to an international standard, and by 1988 the ANSI committee had successfully integrated changes requested by the ITU-T and was well on their way toward the issuance of the new standard. 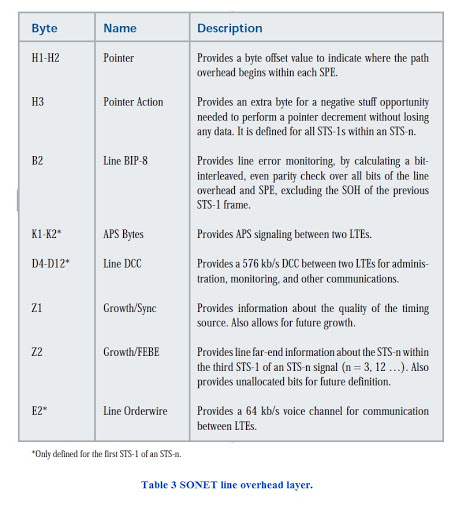 Today, the SONET standard is contained in the ANSI specification T1.105 Digital Hierarchy – Optical Interface Rates & Formats Specifications (SONET), and technical recommendations are found in Bellcore TR-NWT-000253 Synchronous Optical Network (SONET) Transport Systems: Common Generic Criteria.The SONET specifications define optical carrier (OC) interfaces and their electrical equivalents to allow transmission of lower-rate signals at a common synchronous rate. One of the benefits of the SONET signal, as with any standard, is that it allows multiple vendors provide compatible transmission equipment in the same span. SONET also allows for a dynamic drop and insert capabilities on the payload without the delay and additional hardware associated with demultiplexing and remultiplexing the higher rate signal. Since the overhead is relatively independent of the payload, SONET is able to integrate new services, such as Asynchronous Transfer Mode (ATM) and Fiber Distributed Data Interface (FDDI), in addition to existing DS3 and DS1 services. Another major advantage of SONET is that the operations, administration, maintenance, and provisioning (OAM&P) capabilities are built directly into the signal overhead to allow maintenance of the network from one central location. 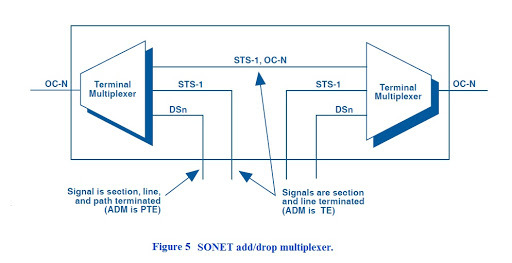 SONET multiplexing combines low-speed digital signals such as DS1, DS1C, E1, DS2, and DS3 with required overhead to form a building block called Synchronous Transport Signal Level One (STS-1). 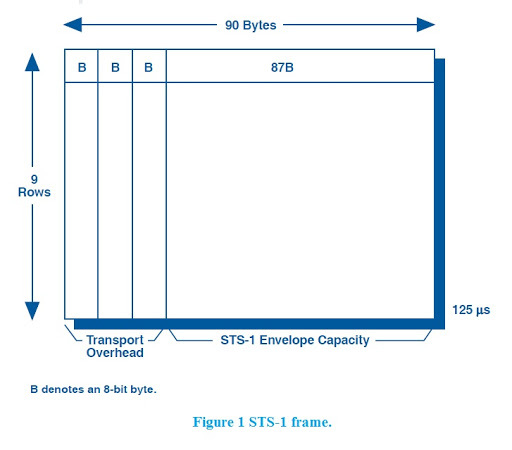 Figure 1 shows the STS-1 frame, which is organized as 9 rows by 90 columns of bytes. It is transmitted row first, with the most significant bit (MSB) of each byte transmitted first. 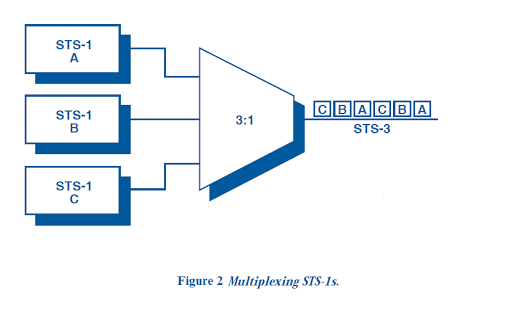 Higher-rate signals are formed by combining multiples of the STS-1 block by interleaving a byte from each STS-1 to form an STS-3, as shown in Figure 2. The basic frame rate remains 8,000 frames per second, but the capacity is tripled to result in a bit rate of 155.52 Mb/s. The STS-3 may then be converted to an optical signal (OC-3) for transport, or further multiplexed with three additional STS-3s to form an STS-12 signal, and so on. 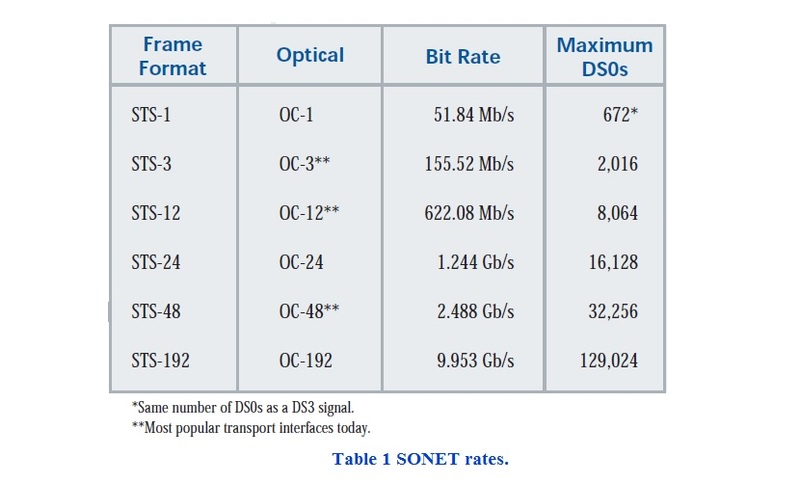 Table 1 defines common SONET optical rates, their equivalent electrical rates, and the maximum number of DS0 voice channels which can be carried at that rate. Figure 3 shows the STS-1 frame divided into two parts to physically segregate the layers, where each square represents an 8-bit byte. The first three columns comprise the transport overhead (TOH), while the remainder is called the synchronous payload envelope (SPE). The TOH dedicates three rows for the section overhead (SOH) and six rows for the line overhead (LOH). The SPE contains one column for the path overhead (POH), leaving the remaining 86 columns for payload data (49.536 Mb/s). 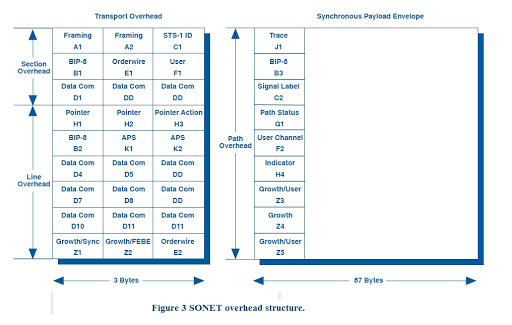 The SONET signal is layered to divide responsibility for transporting the payload through the network. Each network element (NE) is responsible for interpreting and generating its overhead layer, and for communicating control and status information to the same layer in other equipment – in short, “terminating” its overhead layer. 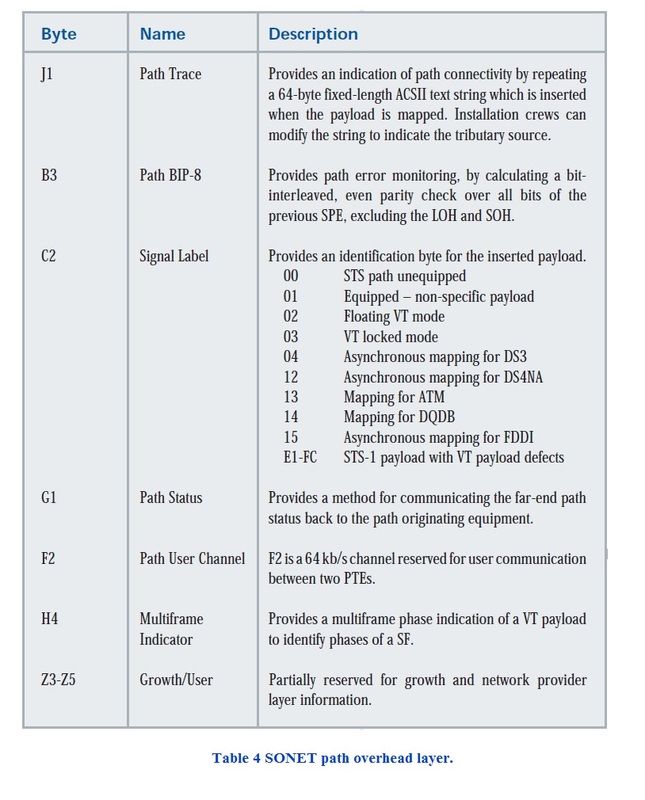 As the payload travels through the SONET network, each layer is terminated by one of a general class of NEs, termed section terminating equipment (STE), line terminating equipment (LTE), or path terminating equipment (PTE). Figure 4 illustrates a sample network with the layered functions identified. The POH is generated at the point where the lower-rate signal enters the SONET network by PTE such as a terminal multiplexer (TM). The POH is removed when the payload exits the network. Since the POH is first-on last-off, alarm and error information contained within this layer represents end-to-end status. The next layer of overhead termination is the LOH and is performed by the LTE such as a SONET add/drop multiplexer (ADM). The LOH is where most of the communication and synchronization between Nes occurs, and represents error information between major nodes in the network. Finally, SOH is terminated by STE, such as optical regenerators, and contains error information between every node in the network. In many cases, LTE, PTE, and STE functions are combined with the identical piece of equipment. Since each layer is terminated and regenerated at the appropriate nodes, the performance monitoring data at each NE will help to sectionalize a problem. and section errors are detected at Site 4, a problem will be somewhere between Site 3 and Site 4. The observed problem cannot be west of Site 3 since all section results are recalculated at every point in the network. If line errors are found at Site 4, a problem exists between Site 2 and Site 4, since line results are recalculated only at major nodes in the network, such as the ADM at Site 2. Finally, if path errors are detected at Site 4, then a problem exists anywhere between Site 1 and Site 4. The ADM at Site 2 adds a twist to the path errors example, due to its flexible functionality as shown in Figure 5. ADM functions as a PTE when the signals being dropped and added are tributaries of the SONET signal. If the ADM has been equipped to add and drop DS3 or DS1 signals, the ADM functions as a PTE for those signals. If it is equipped to add and drop STS-1 or OC-n signals, the ADM functions only as an LTE for those signals. This fact must be considered in the scenario in Figure 4. The path statement must be modified to add the condition that if path errors are located at Site 4, and the origin of a DSn tributary within the STS-1 is at Site 1, then a problem exists between Site 1 and Site 4. Otherwise, if any DSn tributary within the STS-1 originates from Site 2, then a problem exists between Site 2 and Site 4. So, in troubleshooting a signal, it is important to know where the path originates. Since the origin of the signal is an important factor used to isolate trouble spots, the SONET signal itself provides a method to tag every STS-1 with information about its location. The J1 Path Trace Byte fills this role. This byte repetitively carries a fixed-length, 64-byte, ASCII string that can be programmed at system turn-up to carry textual information about the originating node, office, or customer. Because this information is never terminated by LTE or STE, it can only be assigned at the originating point of the signal. Many of the bytes in the tables are undergoing further definition and/or modification.